Stephen Burt is one of our leading critics. Focusing on poetry, his criticism is quirky, incisive, and always hugely intelligent. Not surprisingly, Mr. Burt’s own poetry reflects these same qualities. Belmont: Poems, his third book of poetry, is, like all of his work, eclectic to say the least. From “Draft Camp,” a stunning poem dedicated to one of Mr. Burt’s ongoing enthusiasms, the WNBA (Women’s National Basketball Association); to “In Memory of the Rock Band Breaking Circus,” dedicated to another of his fascinations, small rock bands, this collection illustrates Mr. Burt’s versatility. Brought to bear on almost any subject, Mr. Burt’s considerable aesthetic gifts and his skillful and flexing way with poetic craft result in poems that are breezily contemporary in feel, yet deeply lyrical in quality and effect. 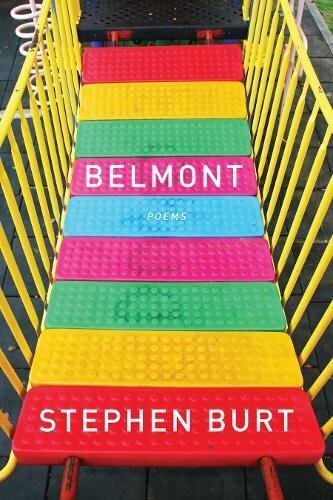 Many of the poems in this collection focus on the community of Belmont, Massachusetts, where Mr. Burt lives with his family, which, one might think, accounts for the title of the book. That, however, is not entirely the case, mainly because nothing is ever entirely the case with Mr. Burt. The book’s epigram reads: “Come, you and I will thither presently;/And in the morning early we will both/Fly toward Belmont./” which is a quote from The Merchant of Venice. Belmont is, then, an appropriate title for this collection of poems, given that poetry can be viewed as a kind of retreat from which the world (along with its emotion) can be “recollected in tranquility,” to echo William Wordsworth. In Part 1 of Belmont, the reader is invited in—to be a part of some of the most delicate moments and realizations of family life—the birth of a child, its early development, the nuanced life of the small, intimate community, its daily happenings, the fashions of its life, the sounds, those aspects of nature that are enlargements of existence, and, of course, insights into how lives will evolve, as all life does. These poems are focused and engaging as you are invited to share circumstances, commonalities, and visions of things beyond—extending to Belmonts of the world everywhere. The metaphors are, without exception, controlled, precisely focused, and by their very nature, enlargements on even the most matter-of-fact realities of community circumstance. “Sunday Afternoon,” for example, is a brief tongue-in-cheek paean to the suburban afternoon nap. Mr. Burt’s peripatetic muse might be likened to Frank O’Hara’s, but on steroids. In Part 3 of this collection, for example, Mr. Burt moves from “Prothalamion with Laocoön Simulacrum” through “Sunday Afternoon in Chapultepec Park” to “Ocean State Job Lot.” And then with the poem “Over Wingaersheek Beach” we unexpectedly join his son, Nathan, who is quietly flying his kite in the sea air. It is in the confines and metaphorical extensions of the Belmont collection that chords of universality are strategically and resoundingly struck and/or echoed. Belmont is an outstanding collection, at once thoughtful and witty, meditative but rapid-fire, a domestically rooted yet lyrically urbane accounting of modern life as interpreted by one of the gifted critical intellects of our time.